December 13 is Lucia Day in Sweden, a celebration marking the long dark winter with candle-lit processions and music. Swedish expats in Shanghai celebrated the festival over the weekend. The tradition dates back to the Middle Ages and was originally held in memory of Saint Lucia of Syracuse, a third century martyr who, according to legend, brought food and aid to people. Nowadays, the day is also a celebration of light in the middle of the dark Nordic winter. A Lucia procession was held in the city yesterday with songs sung by children from a Swedish choir and schools in Shanghai. They wore traditional Lucia white gowns and performed for about 30 minutes. “Every year, December 13, we celebrate Lucia. Lucia comes with light. In Sweden, it’s really dark at that time, so you would have these ladies dressed in white, with candles in their hair, and they are coming to all work places, all schools, wherever you are, there will be a Lucia celebration. You combine it with Lucia buns, and try to feel a little happier about the dark period,” said Lisette Lindahl from Swedish Consul General in Shanghai. Lucia buns, a traditional food for the festival, were provided at the celebration along with gingerbread cookies and mulled wine, attracting many people. Consulate officials say Chinese students who study Swedish in local universities helped them make the food. 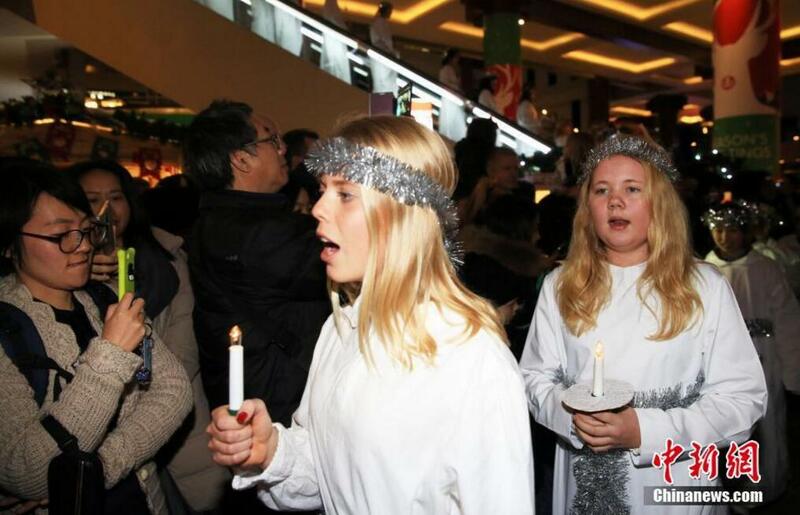 “It’s a traditional to follow, I haven’t been to so many times at the Lucia celebration in Shanghai, but I think it’s a good tradition for the Swedish people, and it’s also new to the Chinese audience, so I hope they will enjoy this,” said Swedish expat Eric Zhang. “Well, back home it’s much colder, so there will be snow. Usually in our hometown, there is a big Lucia celebration in the city, so we used to go and watch that,” said Swedish expat Alexandra Kohring. Lucia Day is also celebrated in Denmark, Norway, and Finland.